Too steep for dry snow.. Happy Christmas everyone. It’s been all happening for me - ups and downs. First up I have been in the foundation stages of next years training, putting in four or five hours a day on my board, doing my moves and exercises. My body feels great apart from a core stabiliser muscle in my trunk which is causing some pain and concern. More on this later. As much as this could get in the way of immediate performances on cliffs, it’s letting me get on with the much needed work of preparing my body for next year’s objectives. For the last couple of years I’ve been quite focused on short term objectives, hence not doing any hard routes, just lots of ‘easy’ ones. Not easy of course, just easy enough to do in a couple of days. Two E10s, three E9s and a good few E8s this year. I’m ready for a big one or two routes again. And that means short term sacrifice. I’ve made several changes to my training, which are going great so far. I’m excited for next year. After training I’ve also been doing a ton of reading about training and about injury rehabilitation as I continue to work hard on my book Rock ‘Til You Drop. It’s fascinating. There is so much to learn. But I must admit it’s been hard to sleep. I’ve got the information coming out of my ears by the time I go to bed. Usually 3am at the moment. On our way home from Christmas in Glasgow, we briefly became accident statistics. After sticking below 40mph all the way from Glasgow in sleet and snow in Claire’s 4x4, a ridiculous stretch of black ice took control of the car on Rannoch Moor. I managed about 5 anti-steers back and forth, keeping the car facing ‘forward’ (roughly) for about 200 or more yards. But it was useless and I had time to apologise to Claire and receive her acceptance as we spun a few more times and were finally deposited in the ditch. A winch and a couple of hundred quid later, we drove home, at jogging pace. Thanks to the lads who tried to help us get the car out under our own steam. I have your snow shovel. Drop me a line and I can send it back. Our fresh stock of Mountain Equipment Pro-Team T-shirts arrived just before Christmas. It’s a short run from ME and we are due to get more sometime in the spring. But just to say the current lot are selling fast, so if you want one get it now. There are 3 male mediums left at the moment! Claire has added chest sizes for them on their page in the shop so you can be sure which size is right. We have been impressed with the quality of the new run of T-shirts, great quality organic cotton and a little ‘heavier’ cotton and crisper print than the previous batches. In the shop here. [UPDATE] The mediums are now sold out for now. Small is a chest size 28 and large is 42. More and more of you are asking each day about our last posting dates for Christmas from our shop. Claire is dispatching every day as usual, via Royal Mail. If you’re ordering within the UK then you ought to get your order in by last thing Monday night (20th) to make sure it’s there before Christmas. Please be aware things are sometimes taking a little longer as Royal Mail still seem to be delayed in a few places by the snowy weather. We’re expecting new stock of the Mountain Equipment Pro-team T-shirts later today and will put all the sizes up in the shop as soon as they arrive. We've been out of men's sizes in these for ages and I know lots of you asked when they were coming back. As always, if you want anything signed, just ask, in the special instructions field of the PayPal checkout. Thanks to everyone who’s ordered from us recently. Claire’s been doing a great job in the office getting everything out in double quick time every morning. 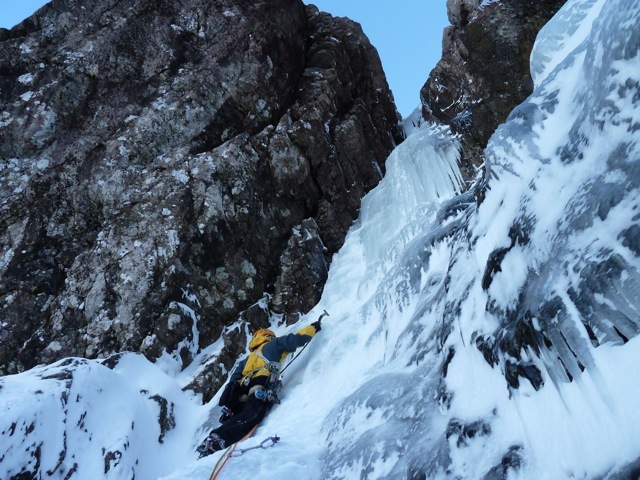 Michael on some nice ice, on the way to look at some steepness and then abseil off. It’s been an up and down couple of weeks. I tried training hard but ended up annoying an arm muscle and having to back off just when psyche levels were getting very high. I must admit I got a bit fed up after that and put my energy into various writing tasks I’m working on. A lot of work got done, and now my arms are feeling ready for some training again. So it's worked out well. I went with Michael to look at a winter project, a very steep one. But it’s 45 degree steepness meant it was the only route on the cliff not in condition. ARRRGH! Next time. 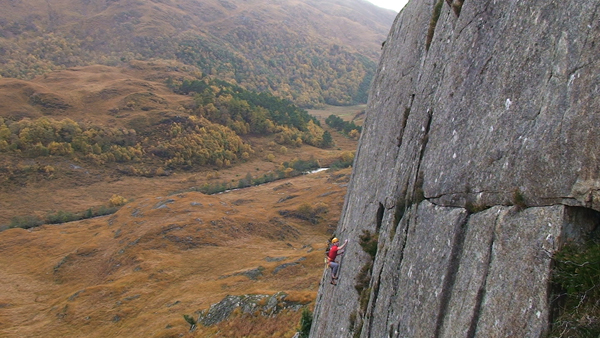 Ukclimbing.com just put up my video of Die by the Drop E10 7a, Apophenia E8 7a and Kev doing Frustration E5 6a on the slab at Glenfinnan. Here is the trailer for The Pinnacle DVD, ice climbing on Ben Nevis following in the footsteps of Smith and Marshall. Brilliant for the winter psyche!The DVD is in the shop here. This is an extended clip of Michael making a determined second ascent of my own problem Bone Broke (Font 7c) in the Arisaig Cave last week. The wee fire was great, shame the wind was blowing it into the cave for the full winter cave dwelling experience!